Many of you saw in tea shops or advertisements small balls of leaves and flowers. What is it?This, so-called, bound tea or blooming flower. This tea consists of a bunch of dried tea leaves wrapped around one or more dried flowers. To make tea leaves easier to give desired form,usually use green unfermented tea. This tea is also unusual because it is hand-made, it takes about 10 minutes for master to make one composition. One master can wring about 2.5 kg of tea a day. This tea is made from top leaves or leaf buds (tipes) of the tea bush, which are collected only during the rainy season. Composition must retain its shape, so it is processed immediately in harvesting day (fermented, twisted and dried at 110 °C). Important element in this composition is flower. Most often it is chrysanthemum, jasmine, osmanthus, lily and many others. Then leaves are sorted along the length, they are collected in the same bundles, in the middle of which flower is laid. Further this composition is connected with special fibre, after which it becomes like a ball. After that, the product is dried in oven at 90 °C. It can have variety of shapes, but most often it is a ball as a symbol of love. But you can meet other, sometimes exotic forms. Each product is unique, and when brewing, it opens completely differently. 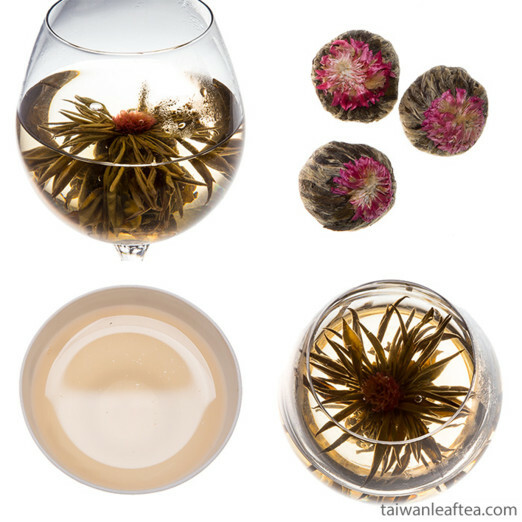 In order to fully enjoy the beauty of this tea, brew it in glassware. Order Blooming oolong tea on Taiwanleaftea.com and enjoy the beauty and taste.